Our online ticket sells are over. anytime BEFORE the show starts. Please note this will be $25 @ door, day of show until it’s sold-out! And yes, this will prolly sell out! Notion with 1 title or category is just not possible. • Jedi Mind Tricks • Jern Eye • Tableek of Maspyke • Icon The Mic King & countless others. He is also the co-founder of the austin based, musicNmind. & tours across texas featuring the best of national & regional artists. hip hop culture deepened, their volumes of lyrics amassed. Higgs hails from Orange Texas and BMC, an Austin native from 78723.
their first rap together, they knew they had ignited a fire. Since then, the duo has performed live shows all throughout Texas. as Ruler Why, Dylon Camero & NIP. everything from the International Monetary Fund to inequality. A second album ‘No Clip Full Enough’ is set to release in early 2013! The concepts and ideology of the SubKulture Patriots were created by Brian Tanton aka “The Brain”. 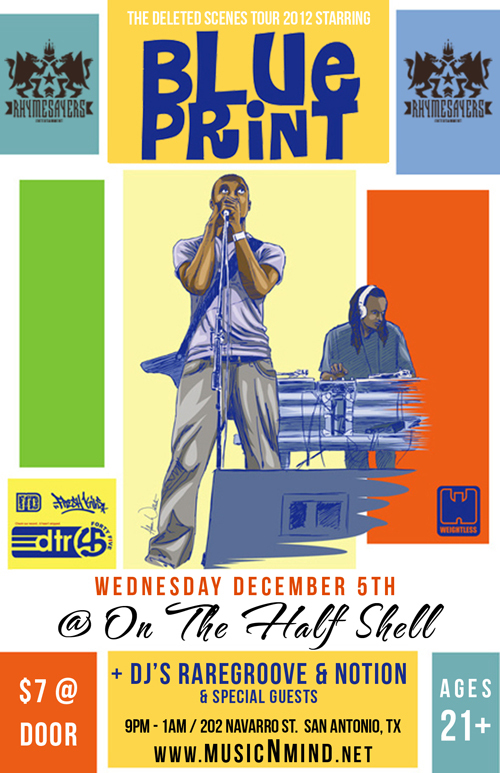 In November of 2010 he linked up with Cap’n Kirk aka AK a former member of Diasporic and the Anti-Gravity Crew. RuDi Devino a member of the Short Bus Alumni and HBZ aka Boo Radley from the critically acclaimed Spin Alley. The result was a group of like minded emcees with one common goal; to share their music with the world. Copies of the new CD “In One Ear, Out The Other, will be available at the show. CHISME (pronounced chees-meh) is the spanish word for gossip. CHISME is a live hip-hop band anchored by the songwriting of R.e.L (Ariel Faz) and the production of Progeny (Erick Frias). They feature live instrumentation with Progeny on MPC-1000 and R.e.L manning the turntables and delivering the witty rhymes he is known for. All songs are accentuated by the percussion of Chadwick Gonzales and the piercing scratches from a number of guest DJs. They open the stage to other local musicians, who do guest appearances throughout the set. CHISME is part of TX independent label Acquired Taste Preferred. They received the 2012 San Antonio Current’s Music Award for Best Hip-Hop group. Their debut album Storytellers, released in January of 2011, won critical acclaim. CHISME received the San Antonio Current’s 2012 Music Award for Best Hip-Hop group. A California and Texas tour gave them plenty of stage time and helped to solidify their live show. Performances at Fiesta del Mercado, Luminaria Arts Festival, and Una Noche de La Gloria help make them hometown heros. 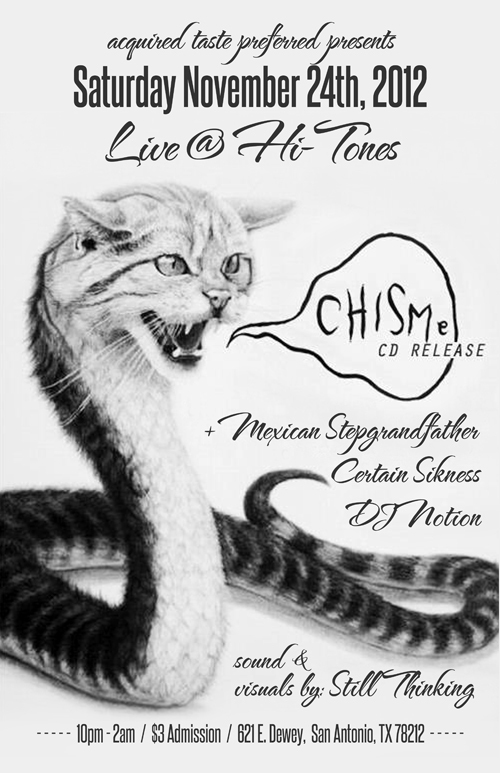 CHISME is releasing a much anticipated EP In One Ear and Out the Other in November of 2012. DJ Notion, Mad One & D.O.S. otherwise it will be $22 at the door. As the marketing genius behind the group, Vin Rock developed Naughty Gear, one of the first HipHop inspired clothing lines. When he got a hold of the worldwide web, he mastered it with http://www.NaughtyByNature.com, further developing and expanding the reach of the Naughty brand. Throughout this time, Treach and Vin Rock continued to tour and perform around the world. In 2002, the duo struck a deal with TVT Records and produced their last album, IIcons. you’d better hold on – because this time around, it’s gonna be one hell of a ride. joined by DJ Notion, Mad One & D.O.S.